Cabka-IPS to Present the Eco P3 for the Chemical Industry. The Eco P3 was developed specifically for the chemical industry and tailored to its logistical challenges: minimizing the risk of damage to the load as well as designing a trouble-free flow of goods. “As we noticed last week at the Forum Chemical Logistics in Antwerp, the consistently refined design is of particular interest to most visitors. The Eco P3 does not differ in size from the standard CP 7 wood pallet, but offers all the advantages of a plastic pallet.” says Peter Feys, Sales Director Chemical Market at CABKA. The projecting wing deck provides a very large support surface and allows the transport of large quantities even on smaller conveyors. The six extra-wide runners have two other decisive advantages: Block stacking prevents them from sinking onto the bags stored underneath, and ensures smooth transport via roller conveyors and chain conveyors. 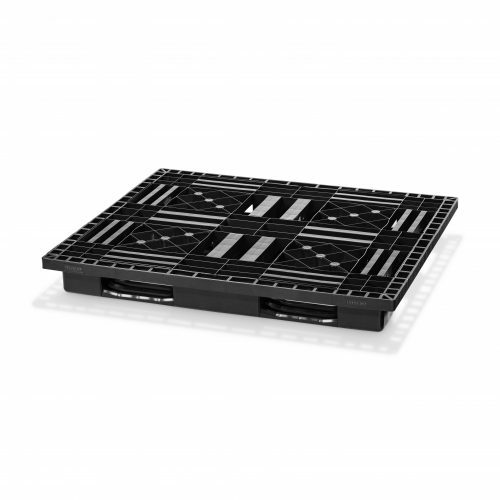 Furthermore, the “wing design” construction with slightly rounded corners facilitates more stable packaging of the product with stretch film and offers forklift trucks the option of lifting the pallet in additional areas. The Eco P3 has the same dimensions (1300 x 1100 x 150 mm) as the wooden pallet CP 7, but it is significantly lighter at only 12 kg and thus offers an attractive price-performance ratio. At the same time, it is free of splintering and sharp edges and protects the bags stacked in this manner against abrasion and damage.